The former Ireland international says that teams have been in touch to ask him about the Derby midfielder. 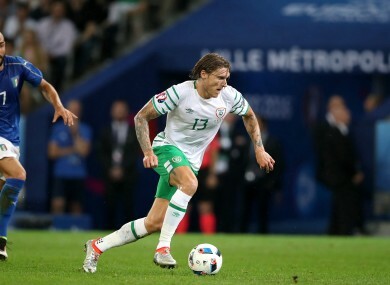 Jeff Hendrick was one of Ireland's standout players at Euro 2016. NIALL QUINN SAYS he would have “no hesitation” recommending Jeff Hendrick to Premier League clubs, though feels not everyone is entirely convinced by the Ireland and Derby County midfielder. Quinn also revealed that representatives of clubs had contacted him about the 24-year-old Dubliner, who caught the eye while representing Ireland at Euro 2016 this summer. And despite Hemdrick’s involvement in an upcoming trial, Quinn believes this situation is unlikely to have an impact on the player’s valuation. “That has never been mentioned in circles that I’ve been in,” Quinn said, speaking at Sky Sports’ Premier League Coverage Launch in Dublin yesterday. “We’ve been talking about him and one or two people have rang me about him. I think they have to convince themselves that it was a not a one-off in the summer. I think that’s probably where a lot of the decision makers at clubs are on prospective transfers, from what I can see. “Was there enough in his Derby performances last year to suggest that what he did this summer can automatically kick on? “That’s where there is a question mark. That’s the way his career is at the moment. I am sure he is bursting for a chance to prove that it’s the right way. In terms of value for money, I am surprised that somebody has not taken a punt and taken a chance on him at this point at the kind of levels that he has been valued at. “I would have no hesitation in recommending him. You need legs, you need energy, you need a lot of the things he has to play the game. Hendrick, of course, was not the only Irish player to impress in France. Like the Derby man, his former teammate at St Kevin’s Boys, Robbie Brady played every minute of every game, scoring two goals in the process. Quinn, who is no stranger to the intricacies of the Premier League transfer market owing in particular to his time as chairman of Sunderland, suspects a prospective transfer involving Brady could go down to the last day. There’s a lot of talk about (a big-money move) at the minute. It could go to the wire, if valuation is the issue, because I think his club have put a fairly high tariff on his head that maybe wasn’t there before the Euros. That’s just the transfer game that’s in play. If it comes off for him, I think it’s great for us and for whoever he goes to. “His goals record is speaking for itself right now but not only that, his ability and his lack of fear, aligned to that skill set that he has, makes him stand out. Despite being sold by Man United early on in his career, Quinn suggests this disappointment was the making of Brady. What was never in doubt when I saw him play at Hull City in his early days there when he was trying to get himself going was that he played with no fear and that he wanted the ball in tight situations. In general, Quinn believes Ireland’s Euro 2016 performance “augurs well” for the future and feels the Irish team played with a spirit and positivity that was previously not as pronounced, likening the side’s recent attitude to his own time in the Irish squad under Jack Charlton and Mick McCarthy. The great thing whether it was way back when I came into the squad, or any squad that has done well, under Mick or now with Martin, you burst a gut to get into the squad and then to get over for the games. You felt every time you landed over to be with the Irish squad that you were in a privileged position. And finally, despite insisting for almost two months now that he is going nowhere, the FAI have still yet to officially confirm that manager Martin O’Neill has signed a new contract despite claims of a verbal agreement being in place? Do Ireland fans have anything to worry about on account of the prolonged delay? It’s just his way of doing things,” Quinn says. “You hope that he’s on side. I certainly think he is. I would hope that what he’s achieving in international football is a better fit for him at this point in his career than going back in at club level. “We all hope that here because we know he brought something very tangible to the team. It’s not even worth thinking about should he not go ahead with it. I don’t think he breaks his word too often; in fact, never I think in terms of becoming a manager of a club or what have you. I don’t have any fears on that front. I might be proved wrong but I don’t think so. Email “'Clubs have to convince themselves it was not a one-off' - Quinn on Hendrick's Euros brilliance”. Feedback on “'Clubs have to convince themselves it was not a one-off' - Quinn on Hendrick's Euros brilliance”.